I love seeing people succeed. I really love seeing humble and hard-working people succeed. 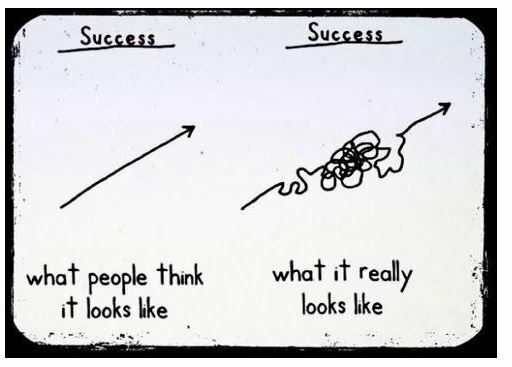 And, as the above chart shows, success is never a linear phenomenon. As an example, consider Malcolm Butler, the now famous Patriots corner back. You know he is a pro football player. But, you may not know that his life has been full of challenges, but he sustained a positive attitude throughout. He kept the customers happy and pleased. I was always pleased. He was a hard worker. Everybody in here really liked working with him. He’s never had anything given to him. Anything he’s got in his life, he’s had to work for and get for himself. You see a lot of guys that are in that situation, and they go the other way. Malcolm realized early on no matter what hand you’re dealt, you’re responsible for your success and failures. He was undrafted, was invited to compete for a roster spot on the Patriots. He made it, playing mostly on special teams. And, then, fortune was on his side and fame followed. The starter in the Super Bowl was benched. Butler’s number was called in the second half. He made some great plays, including the one to end the game. Click here to see an interview with Butler, and you get a sense for the person. I was amazed by his humility. IMO, his humility will lead to more hard work and more success. When you’re arrogant, I believe you try less. You expect success rather than working to earn it. A great game for a great player. Years of preparation led to a moment at which one yard made the difference for a team’s entire season. A Hollywood writer could not have written a more amazing finish to an incredible game. The best part is this: it’s just the beginning for Malcolm Butler. He just finished his rookie year.